Recent outings to a few restaurants catapulted me into a renewed enthusiasm for vegetables, if that is at all possible, considering I cook a lot with veggies, daily. Intensely charred Brussels sprouts with maple syrup, balsamic and a touch of yogurt in one place, charred cauliflower with a smokey ras el hanout, a Northern African spice mix in another, jolted my taste buds. Which brings me to a puzzling list I saw at the beginning of 2013, food trends which need to disappear. I believe kale, kale chips or both appeared on it. I love, love, did I mention, love kale and it is here to stay. 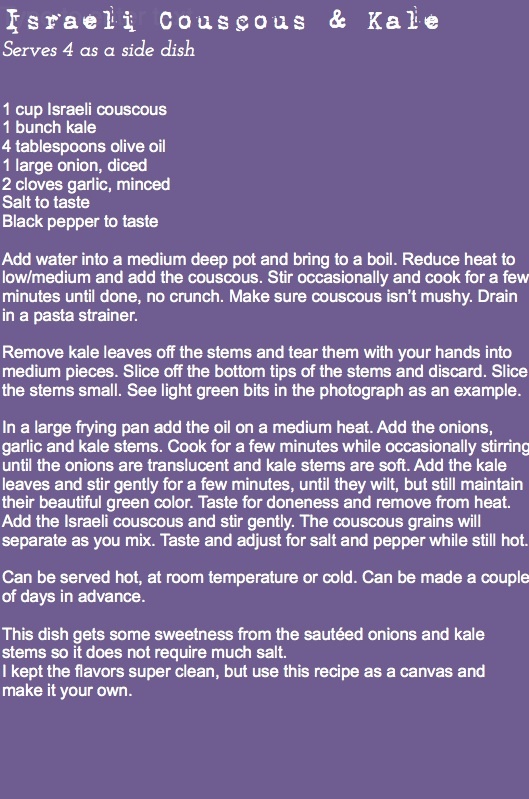 I meant for years to add kale to Israeli couscous, usually make it with sautéed mushrooms, but I hadn't until now. Something about the texture, flavor and color just seems like a perfect pairing. Besides I love photographing kale. Look at the texture. It has so much character. The rib seems like a strong flowing river, the veins are off shoot streams. The green lush rough terrain, intensely rugged. Kale, a leafy green super food, a relative of the cabbage, cauliflower, collard greens, broccoli and Brussels sprouts has a myriad of health benefits, including, but not exclusive to, cancer prevention properties. Kale, until the end of The Middle Ages was one of the most popular vegetables in Europe, until cabbage took its place. Chopping, slicing or tearing the kale, releases further nutrients and healthy chemicals. Slightly cooking and sautéing does not compromise the health benefits but boiling does. WebMD has a short great article titled The Truth About Kale you should read. The extra perk, surprisingly, is when slightly sautéed the stems are sweet. 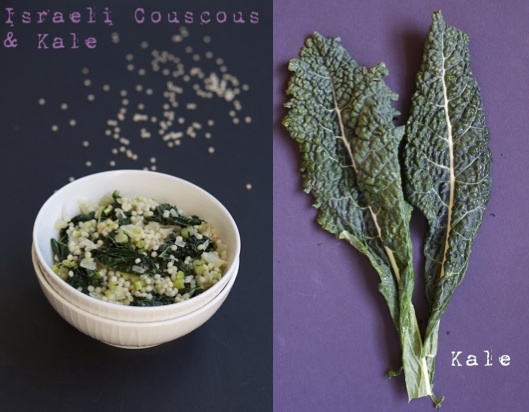 A couple of other favorite kale recipes of ours: Kale, Cannellini Beans and Potato Soup and you can find kale chips in this Dinosaur Kale Chips Chaat post. A wonderful and healthy combination! Israeli couscous is great. I love Israeli couscous, what a tasty side dish! I think we read the same article!! I quoted it as I posted my own roasted kale, or kale "chips". That recipe was actually my first foray into the world of kale, and we liked it. I've never really been a "green" person, and sauteed greens have not been in my repertoire, but I'm eager to learn more about this one. Love the ingredients you have here. I think this is one the kids would like too. Maybe, maybe even my husband! ahaha Kim, I wanted to shy away from wikipedia, though I do read it too. :) My son said kale chips taste like seaweed,:) You can use orzo instead of Israeli couscous. I never understood the "fad" that was kale. It has always been on the French markets and has always been considered a rather poor man's healthy ingredient. Not fancy and trendy. And I have always loved it: in soups, sautéed or steamed, in quiches, tons of ways. And I love it tossed as you have in Israeli couscous. I should do that this week! I can imagine the markets in France, sensational! :) In Israel the Kale just started showing up, so I can see where it is new, a trend can develop. 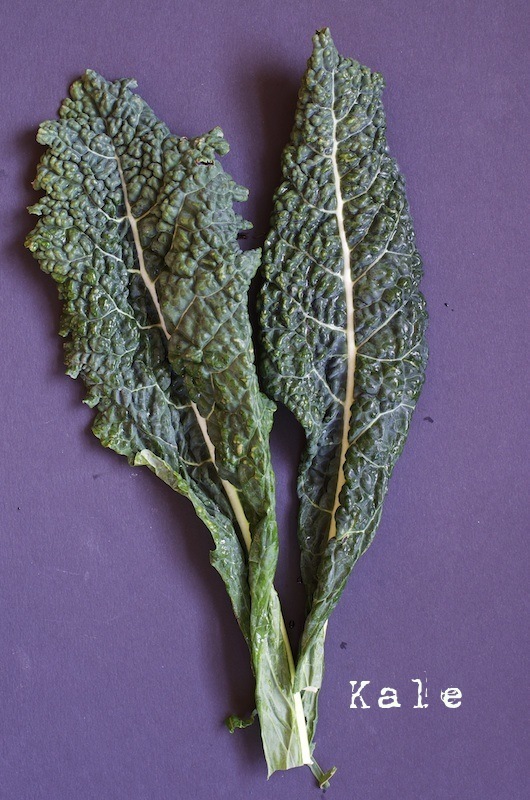 There is however a close relative called Mangold, that is really closer to beet leaves than Kale. Since I didn't grow up on it, I started using kale only in recent years, and quite taken by it, Just like you I add it to everything. 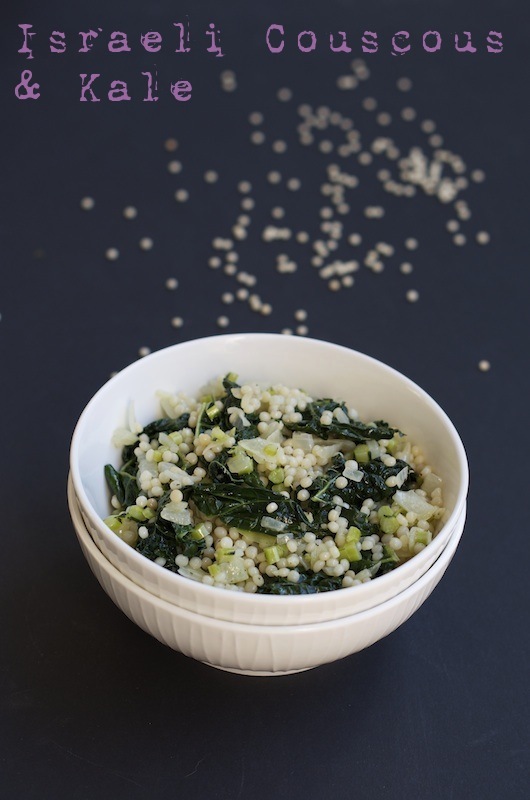 My garden overflowed with chard and kale last summer, so I blanched, chopped and froze what I couldn't use right away. Now, in (what I hope are) the waning months of winter, I'm trying to use up the remaining 8 quart-bags of greens before I plant another crop. This recipe is going on my list. Thanks! I live in a first-ring suburb, so no deer. But rabbits and cabbage worms are the bane of my existence. And the squirrels that devour my tomatoes. And I get about one zucchini per plant whatever precautionary measures I take, due to the newly-arrived squash-borers. And don't get me started on the japanese beetles that are destroying my bean harvest. All behind a 3-foot-high fence of half-inch hardware cloth. Sigh. So I revel in the kale and chard! And am glad I still have some left (and a big jar of Israeli couscous, too) to use in your recipe! כל כך קל נכון?! טעים ברמות. האחיינים שלי שמים קטשופ על זה שזה נראה לי מחריד אבל אולי זה הדור הצעיר בארץ?! :) דא יש לך מתכון לעודת שוקולד שמרים מגולגלת? I'm going to have to plant kale this year.... Never see it in the shops! You might now encourage me to give a veggie garden another go, with kale in it. :) I am surprised you don't find it in store. Are you in France? See above Jamie says you can find it in abundance in France. Let me know when you do Kira, Regular couscous is different than Israel couscous. Cooked this tonight! Such a light but comforting part of our meal!